IPTV Encoder with multiple HDMI Inputs, with Multiplexer, with IP (SPTS and MPTS) and ASI Output. On-Screen Graphics and Scrolling Text Inserter. ⟩⟩⟩ 5. Generation BLANKOM® IPTV Headend Technology. HDMI input, IPTV and ASI output. Logo, Banner and Text inserter. 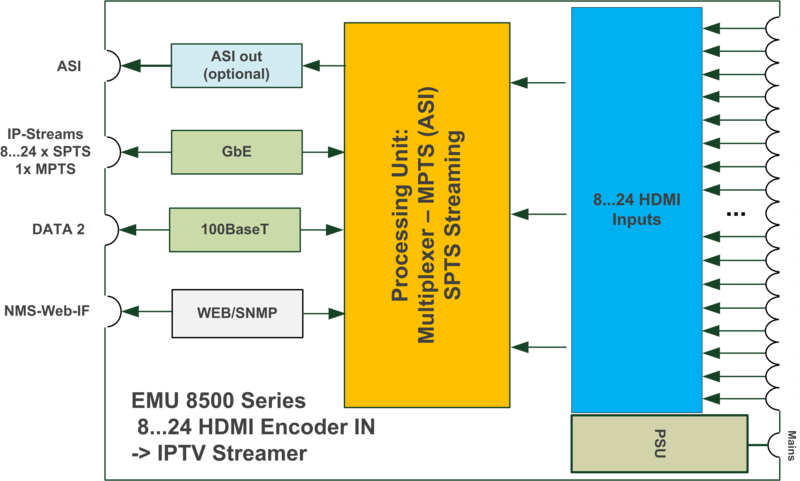 Multiple HDMI outputs can be encoded in SPTS IPTV streams, can be multiplexed into one MPTS IPTV stream and into one ASI Mpeg stream. Graphics and scrolling text can be added onto each service simultaneously. The device can be operated from anywhere on LAN, WAN or Internet. EMU-8500 series 8~24 HDMI input IPTV Encoder with extensive Graphics and Text Insertion features. 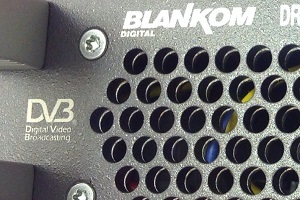 BLANKOM EMU 8500 series MPEG4 AVC/H.264 HD IP Encoder is a professional HD audio & video encoding and multiplexing device. It has 8 ~ 24 HDMI video input interfaces, supporting MPEG-4 video encoding and MPEG 1 Layer 2 audio encoding. This device can simultaneously encode 8 ~ 24 HDMI channel HD audio & video; moreover, it has an IP output port, which can support 1 MPTS and 8 ~ 24 SPTS IP out. There is also an ASI output option. IPTV encoder for multiple HDMI signals with IPTV output. Multiplexer with multiple HDMI inputs, ASI and MPTS IP output.